Grant Gershon and the Los Angeles Master Chorale have spent the better part of a month helping the Los Angeles Philharmonic with their Mahler Project. With their Disney Hall roommates moving on to Venezuela for the rest of the “Project,” conductor and chorus have collectively moved on in their own way without having to leave home on Sunday — to the music of Bruckner (Mass No. 2 in e minor and Os justi meditabitur sapientiam) and Stravinsky (Symphony of Psalms). At first blush, it seemed to be an odd pairing as the two composers share few stylistic similarities; however, Mr. Gershon found common ground by creating a program devoted entirely to sacred music. Moreover, the contrasting works allowed the Master Chorale to show off different sides of its personality, resulting in a diverse evening of radiant singing. Though Bruckner is perhaps best known for his symphonies, his Second Mass is decidedly un-symphonic, being closer to true liturgical sensibility than his other big sacred works: there is a fair amount of a cappella singing, the accompaniment is provided by a small ensemble with no strings, and there are no vocal soloists. Elements of Gregorian chant are ever-present, and Palestrina is quoted in the Sanctus. Still, the piece is full of the multi-layered walls of sound Bruckner is known for, and it played directly to the Master Chorale’s strengths. The LAMC is excellent throughout its ranks, but it is the richness of its male voices that gives the Master Chorale its distinctive sound, and Mr. Gershon leveraged this quality in the eight-part harmony to create a richly textured, organ-like sonority that was unmistakably Brucknerian. At the same time, the LAMC has a strong reputation in performing Gregorian chant, and this become readily apparent in the purity of tone and blend of the Mass’s many unison moments; the opening line of the Gloria was particularly beautiful. In total, it was magnificent: they’d sing with a power that would rival the loudest orchestral climaxes, then soon after imbue the quiter moments with an intimacy and tenderness which left you holding your breath. The second half of the program was devoted to Psalms, beginning with Os justi, an a cappella setting of lines from Psalm 37. The motet is Bruckner in miniature: four-part harmony full of passages high and low, from quiet to grand. Mr. Gershon allowed it to unfold naturally, without pushing tempos or dynamics to the extreme. When it ended, he launched directly into Symphony of Psalms with barely a pause. The Master Chorale has a storied history with the music of Stravinsky. Not only has it sung his music regularly, former music directors Roger Wagner and Paul Salamunovich both prepared choirs for the composer; there is even a story that Esa-Pekka Salonen examined Mr. Salamunovich’s copy of the score which had instructions and notes given to him by Stravinsky himself. The LAMC last sang Symphony of Psalms at Mr. Salonen’s final 2009 concerts as Music Director of the LA Phil, in a presentation where Peter Sellers imposed a great deal of choreography, awkward singing positions, and hand movements onto the singers; that their singing was nearly flawless that night was proof positive of their incredible talent. Sunday’s performance was thankfully absent of theatrics. When combined with Mr. Gershon’s fluid, smoothed-over interpretation — not to mention the choir’s familiarity and confidence with the piece — it gave the performance a relaxed feel. In fact, it sounded almost too easy; the Master Chorale was uniformly outstanding throughout, singing with impressive blend and precision, but a little more edginess would’ve been welcome. But these are relatively minor quibbles, and did not detract from a wonderful evening of music. It was good to hear the Master Chorale perform these composers’ works together, highlighting their unexpected connections. Kudos to Maestro Gershon for pulling off this iconoclastic program in convincing fashion. 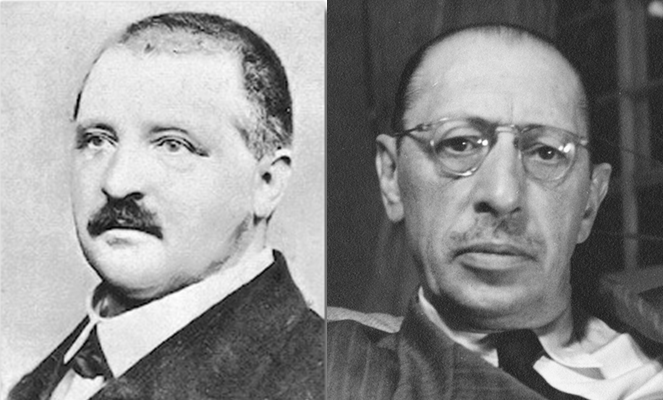 Tags: Bruckner, Grant Gershon, Stravinsky. Bookmark the permalink.